Mandy Shepherd (1960 - ). Watercolour, each one signed with the limited edition copy within the blind stamp..
Standard size: 18 x 13 ins (45.7 x 33 cms) approx. 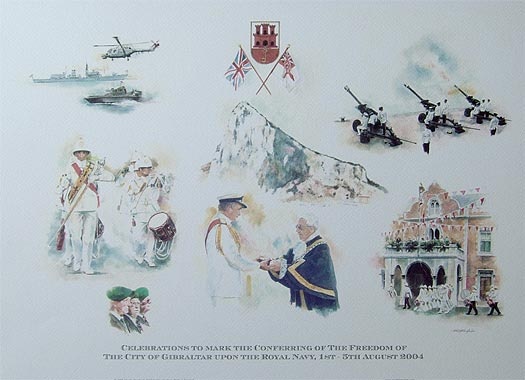 This is a series of vignettes each highlighting some of the major events that took place on the Rock to mark the Freedom of the City celebrations in August 2004. The First Sea Lord, Admiral Sir Alan West GCB DSC ADC, and the Secretary of State for Defence, The Rt Hon Geoffrey Hoon MP, were both present throughout the majority of the week’s celebrations.